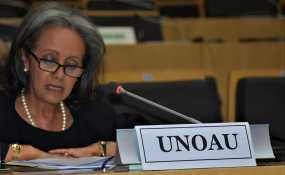 Addis Abeba — Sources close to the government confirmed to Addis Standard late this afternoon news that Ambassador Sahlework Zewde, a prominent Ethiopian diplomat with years of experience with the UN, will be replacing the outgoing president, Dr. Mulatu Teshome, who has been the president since October 2013. Ambassador Sahlework was appointed in June this year by Secretary-General António Guterres as his Special Representative to the African Union and Head of the United Nations Office to the African Union (UNOAU) at the level of Under-Secretary-General, succeeding Haile Menkerios, another Ethiopia to hold the post. before that Director-General of the United Nations Office at Nairobi (UNON). According the her biography published by the UN, Ambassador Sahlework's three decades work with the UN spans from pecial Representative and Head of the United Nations Integrated Peacebuilding Office in the Central African Republic (BINUCA) to the Permanent Representative of Ethiopia to the African Union and the United Nations Economic Commission for Africa (ECA) and Permanent Representative to the United Nations Educational, Scientific and Cultural Organization (UNESCO) and accredited to Tunisia and Morocco. In her work as an Ethiopian diplomat Ambassador Sahlework also served as Director-General for African Affairs in the Ministry of Foreign Affairs of Ethiopia as well as Ethiopian Ambassador to France. From 1993 to 2002, she served as Ambassador to Djibouti and Permanent Representative to the Intergovernmental Authority for Development (IGAD), and to Senegal, with accreditation to Mali, Cape Verde, Guinea-Bissau, Gambia and Guinea. According to Article 70 of the Ethiopian constitution, "The House of Peoples' Representatives shall nominate the candidate for President. And the nominee shall be elected President if a joint session of the House of Peoples' Representatives and the House of the Federation approves his candidacy by a two-thirds majority vote."